The leak was another cut in the shaft tube, low and barely through. The white smoke was a stuck open injector dumping raw fuel into a cylinder. 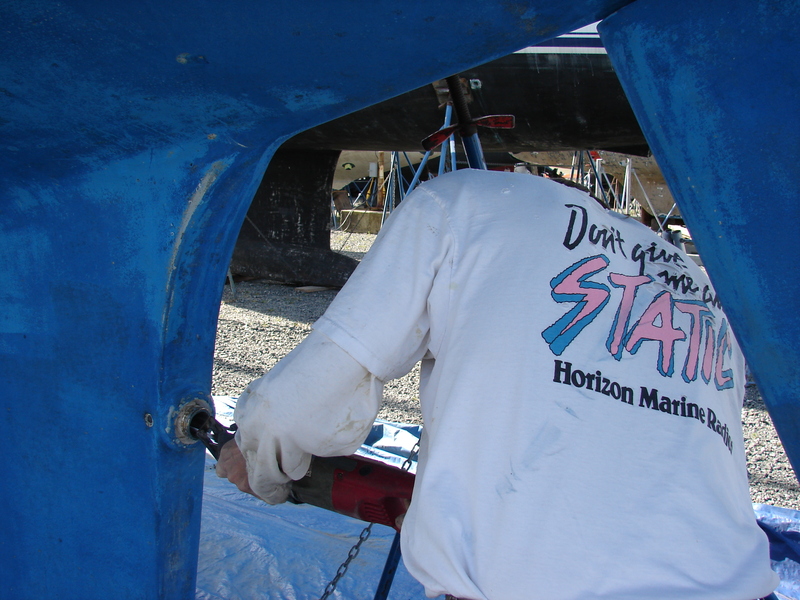 The injector is fixed, and the hull is fixed except for fairing and sealing and painting. So we spend the long weekend in the yard. There’s plenty of work to do. 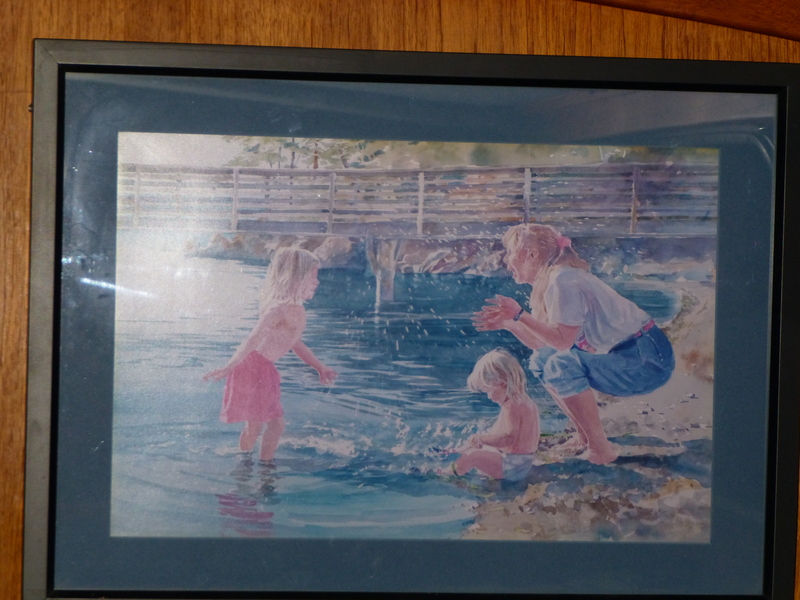 We moved the ship’s clock and the ship’s barometer to starboard, and put up a painting of Nancy and Pender getting splashed by Lena. 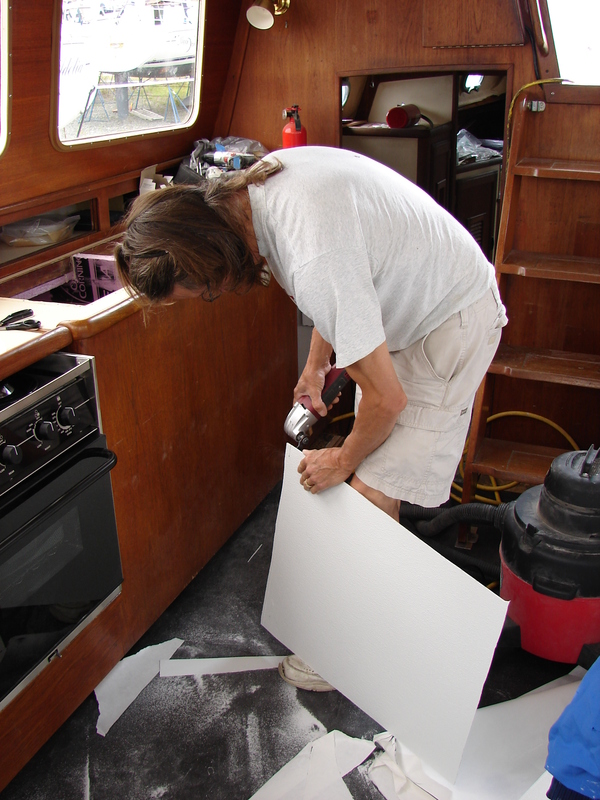 Now it’s our boat, not the boat we’re building. 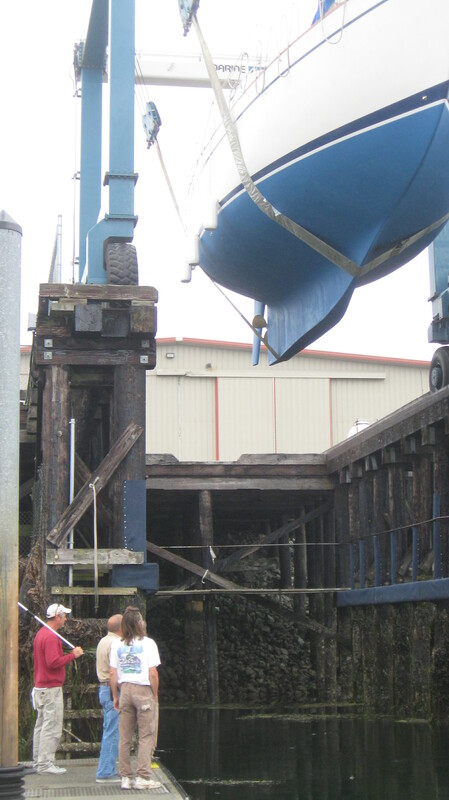 The boat celebrated by returning to the yard for more leak repair. 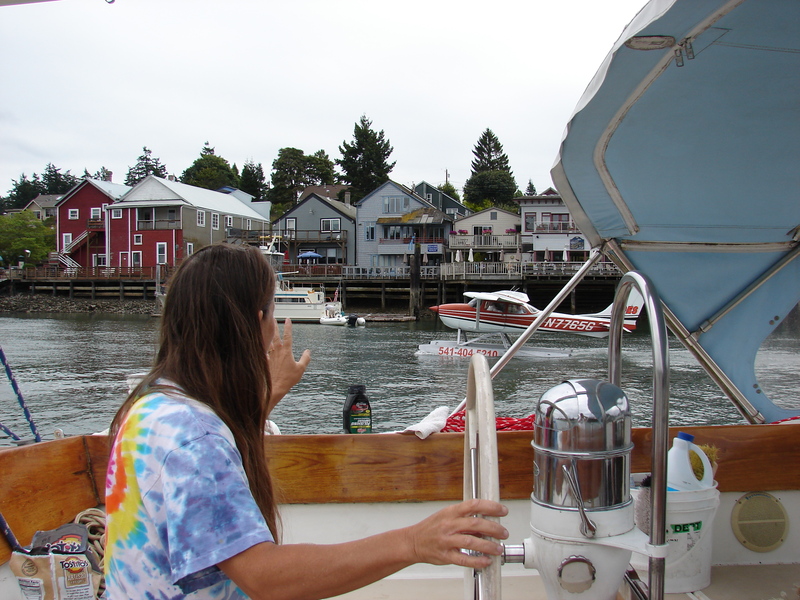 Also, as we approached the dock for the haul-out, our brand new engine started spouting smoke. Lots and lots of white smoke. The proper authorities were notified. I’m sure it will be fine. 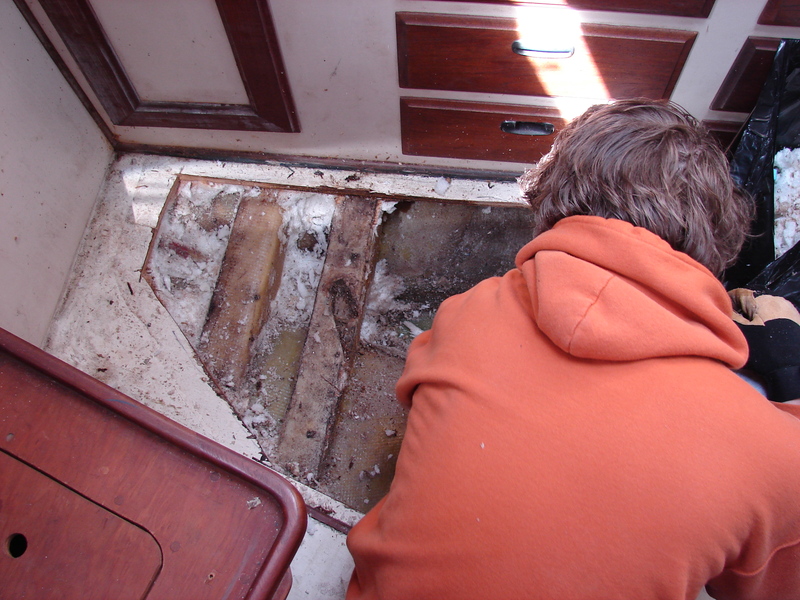 Right after we bought the boat, Pender spent quite a while digging wet styrofoam out of the aft cabin floor. 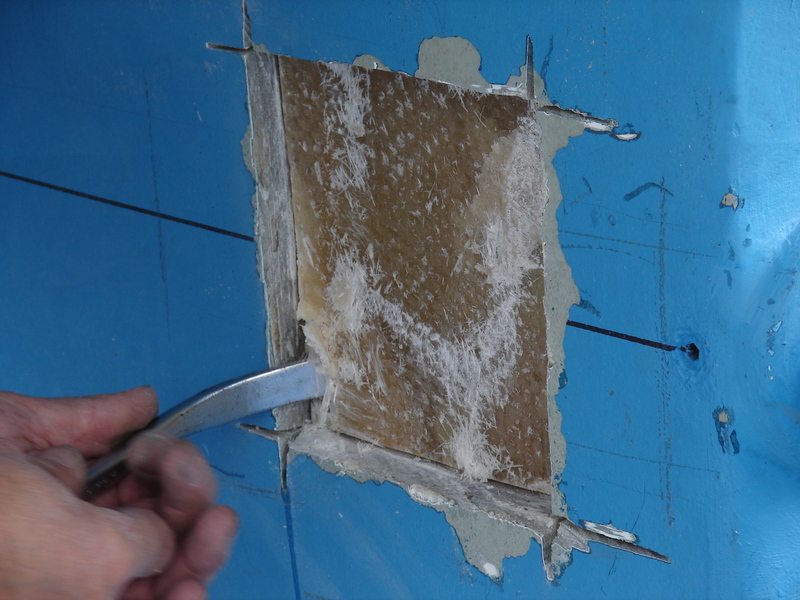 to cut, then bend and remove the bronze-tubed cutless bearing from the keel, directly under the area that was full of wet styrofoam. 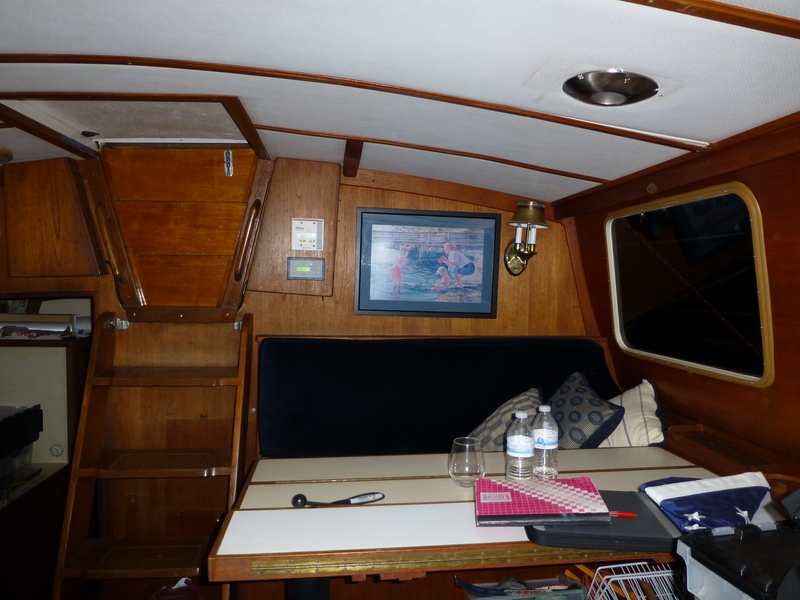 Well, the good news is that we didn’t sink. At least not very quickly. 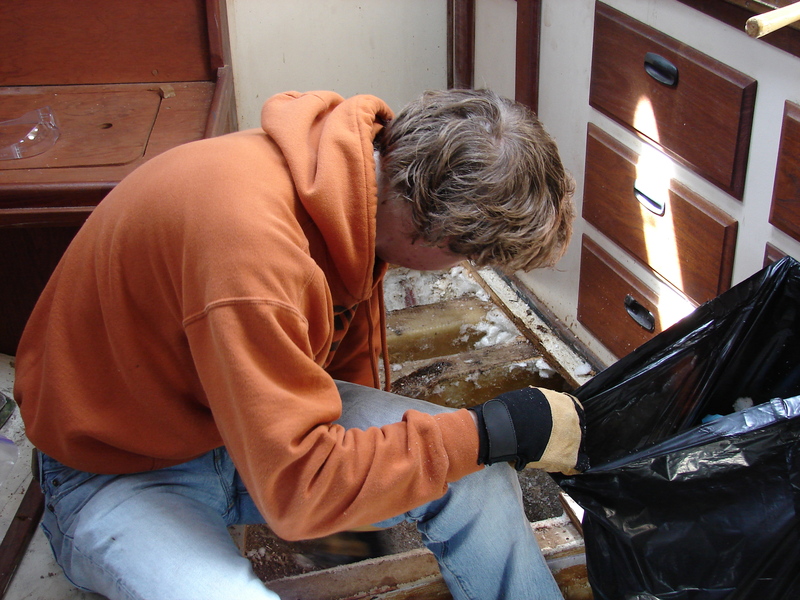 A few days after we launched the boat, water started seeping into the same aft-cabin compartment. Then it started seeping more. Soon it was leaking. 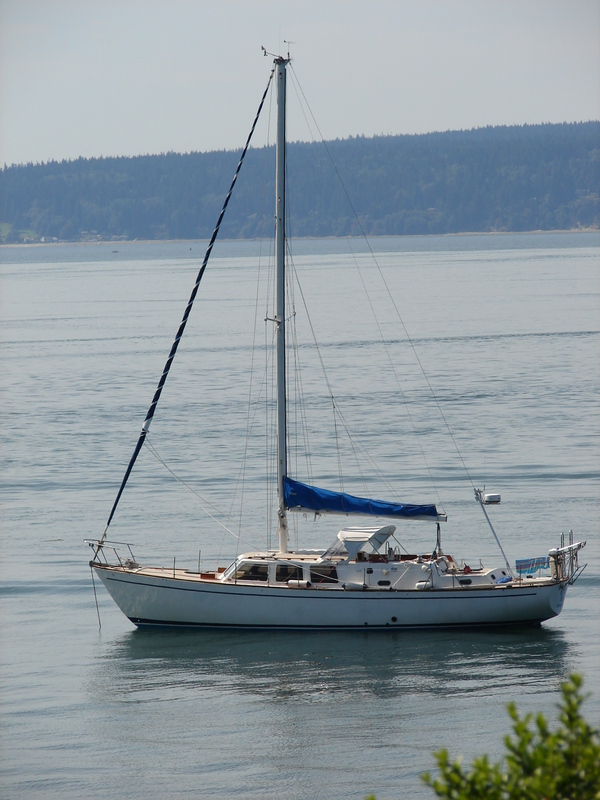 We went back to the yard and hauled the boat. 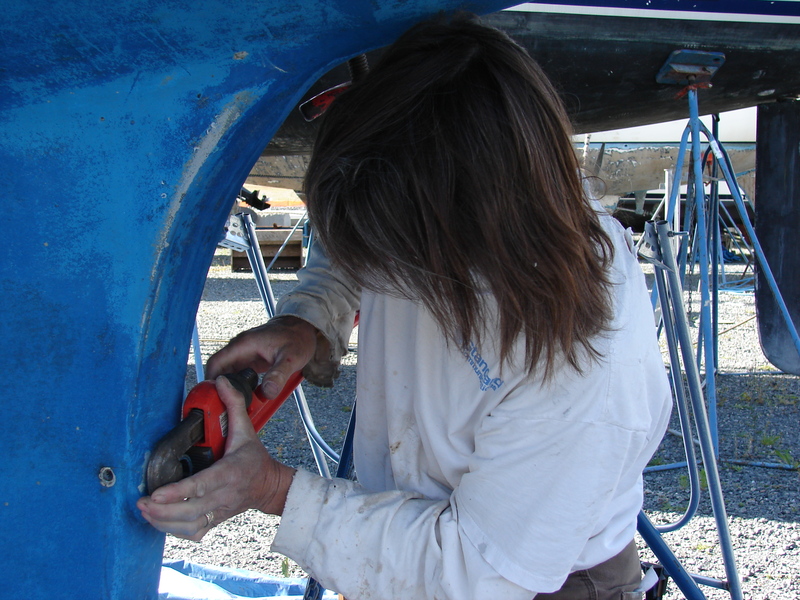 They cut and ground and ground and cut and finally just made a hole in the side of the keel. 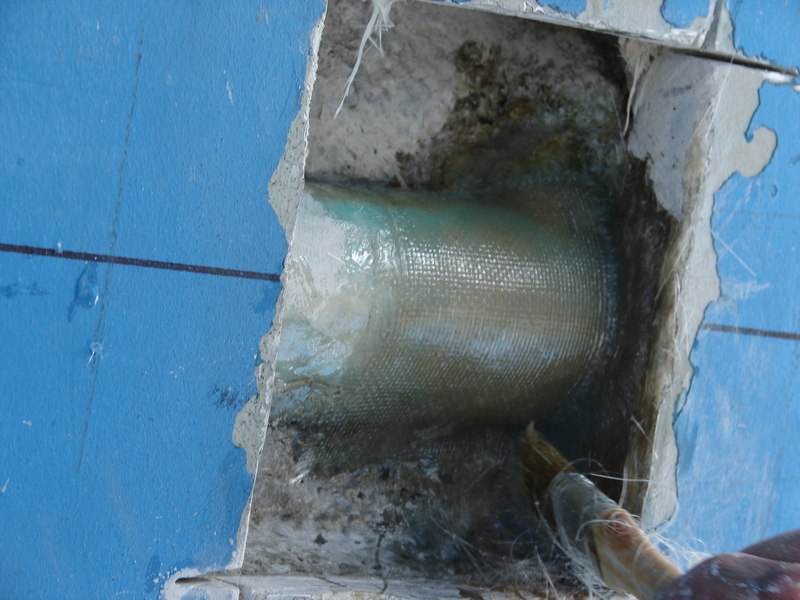 The hull was approximately one inch thick here. Skookum. 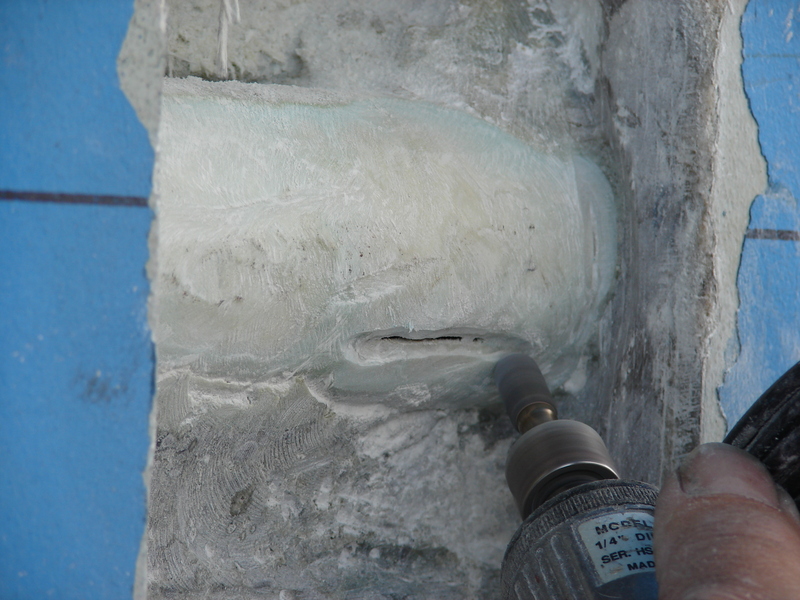 Then an air chisel was used to remove the filler and wet resin from the area. We were quickly able to see where, long ago, somebody (else) had gotten a little too wild with their sawzall and cut completely through the shaft tube. 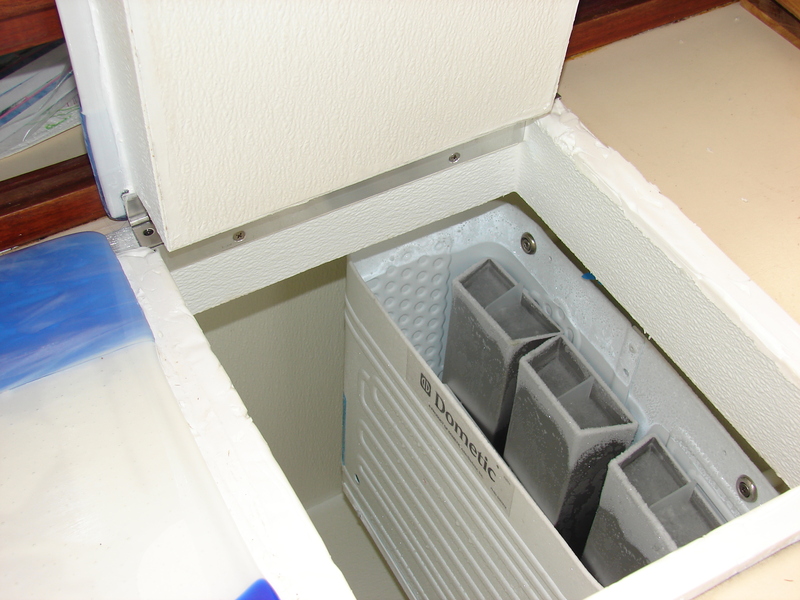 That let water leak through the shaft tube, into the filler in the hull and eventually up through the floor into the aft cabin. 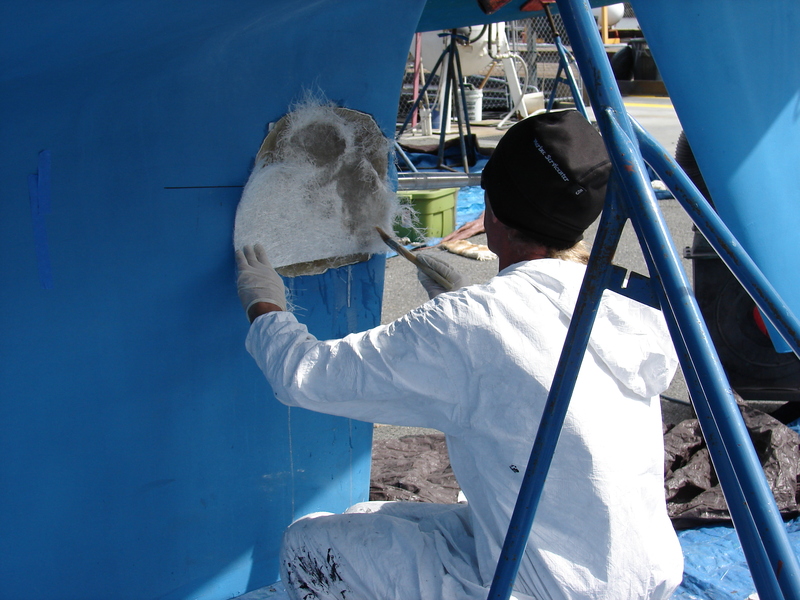 Here the Marine ServiceCenter guys are using a die grinder to feather the edge of the cut so vinylester resin and glass can be laminated back onto the tube. 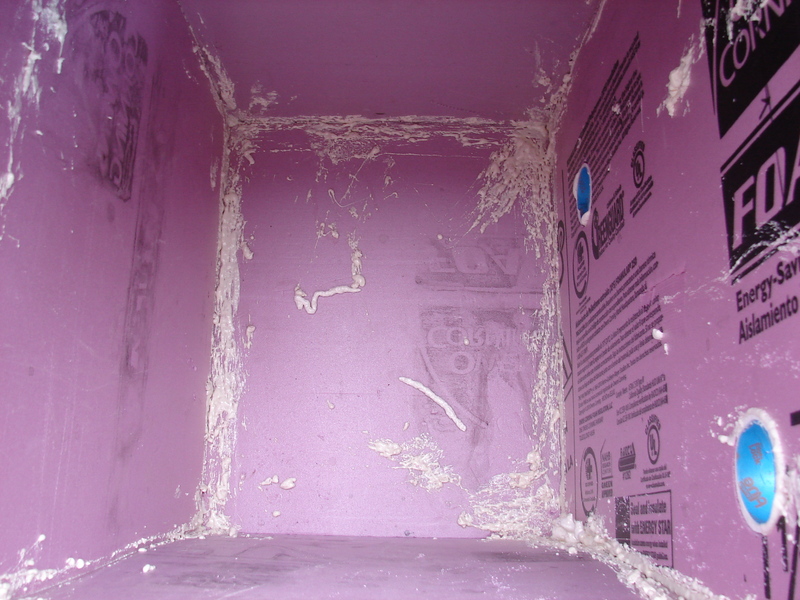 We used compressed air and soapy water to look for other cuts, but this was the only one. They glassed the tube back up to heal the leak in the shaft tube. 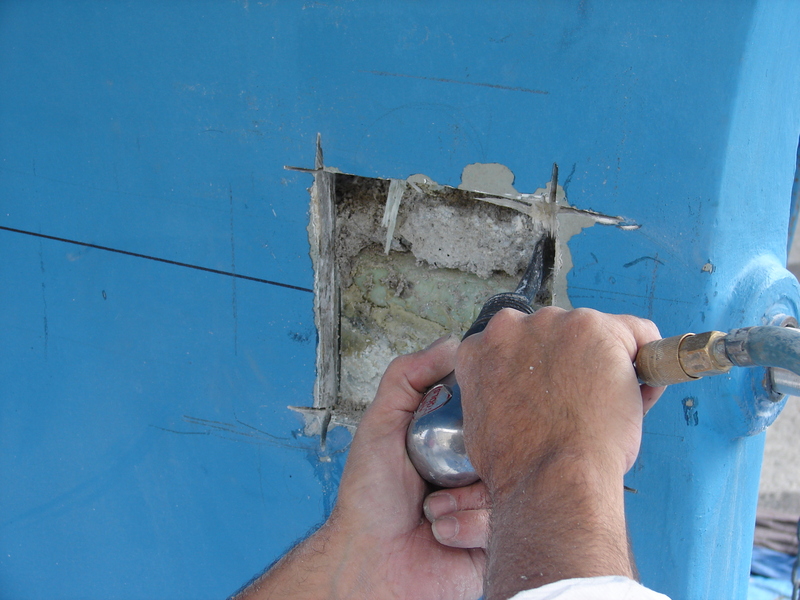 Then they rebuilt the side of the hull. 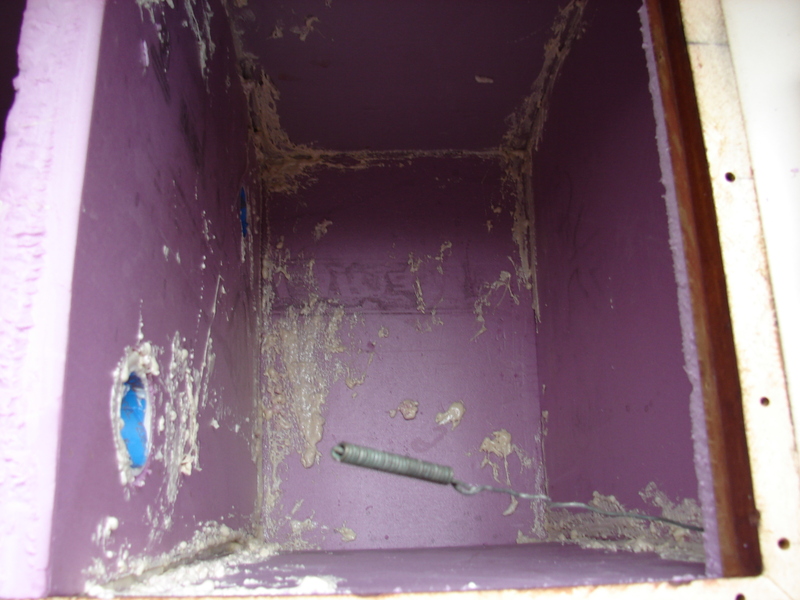 Tomorrow they’ll apply a little more glass and some filler, then the bottom paint, then back in the water we go, completely sink free. 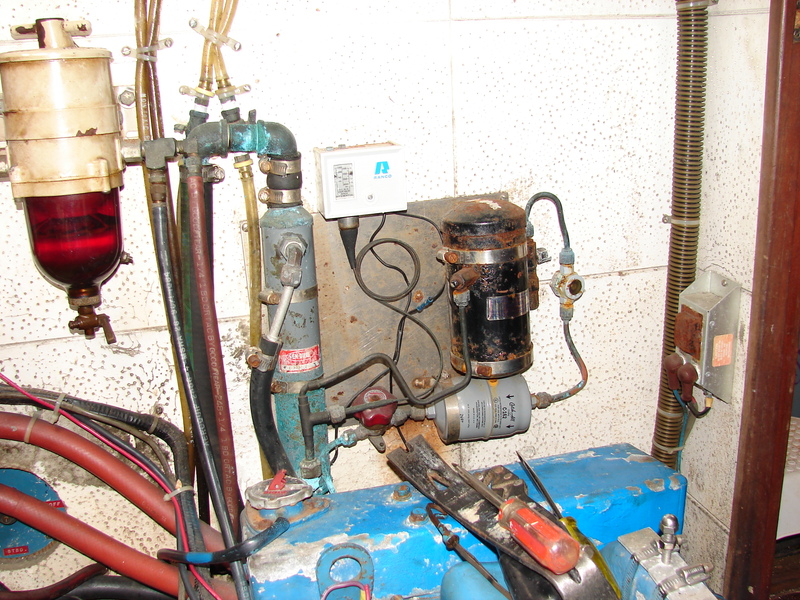 But I’ll still fix the back-up bilge pump. 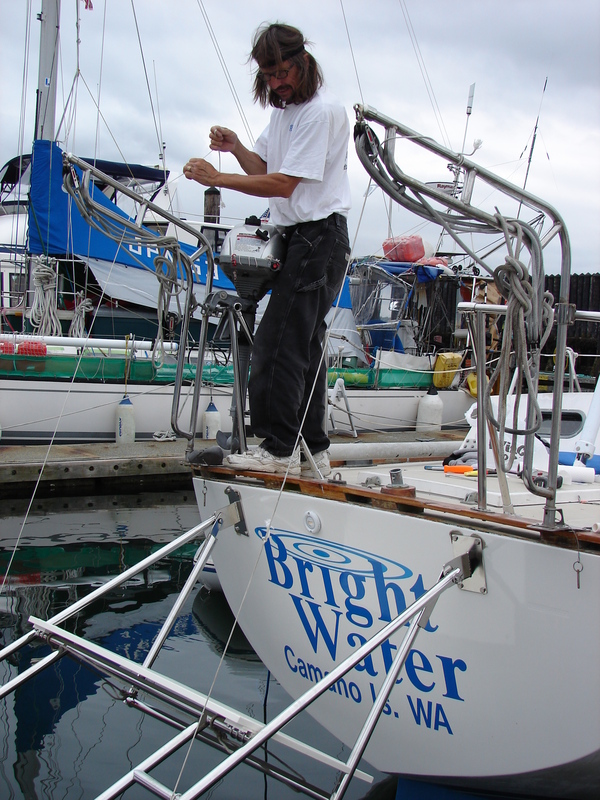 And install the manual back-up back-up bilge pump. A quandry wrapped in a conundrum. 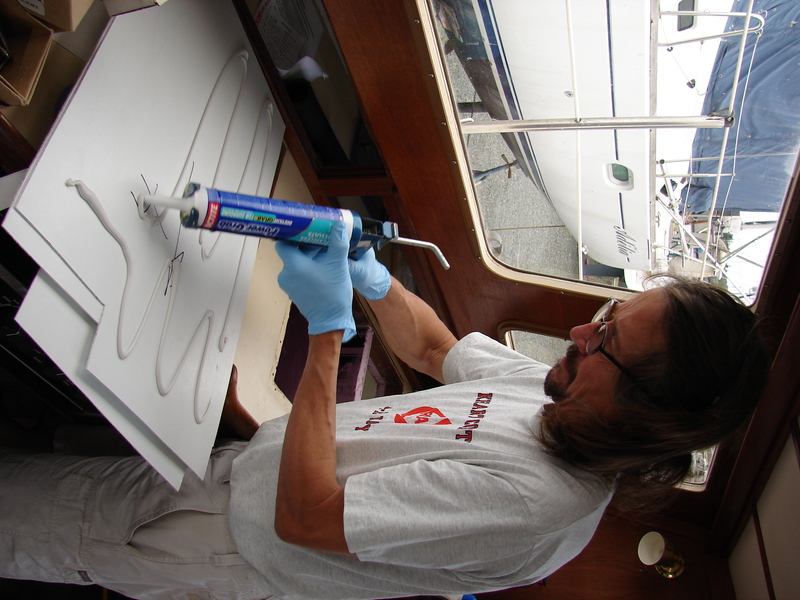 We need to get most of this crap off the boat. The entire project is in jeopardy. There is no way to choose. It’s impossible. 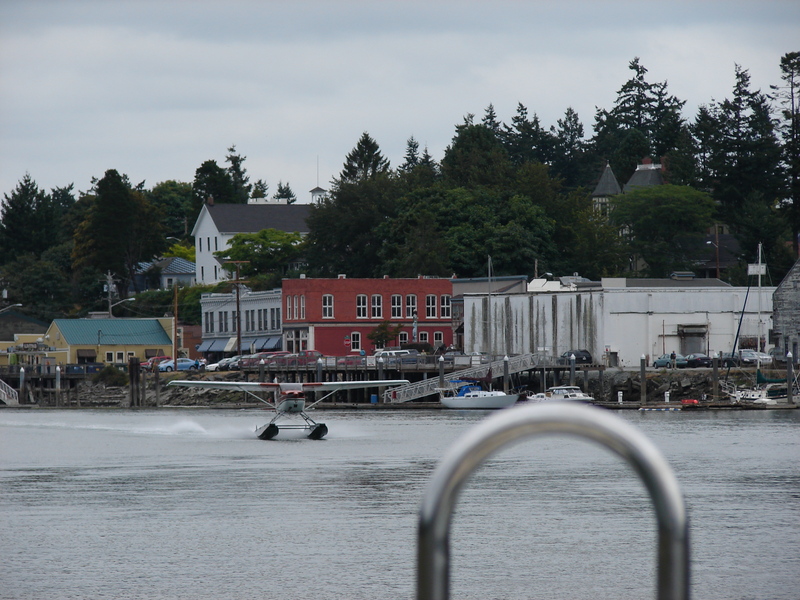 In the Swinomish Channel this afternoon, right in downtown La Conner. This weird little boat passed us in a north-bound way. It doesn’t look very sea-worthy. He wanted another look at our swim step and turned to chase us. 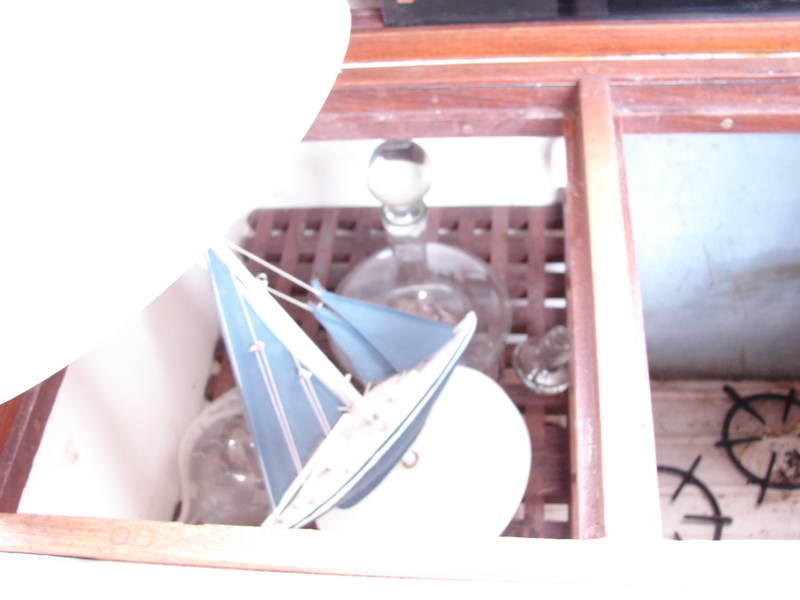 As soon as this little boat passed the bridge, he engaged the transformer mechanism and turned into an airplane. 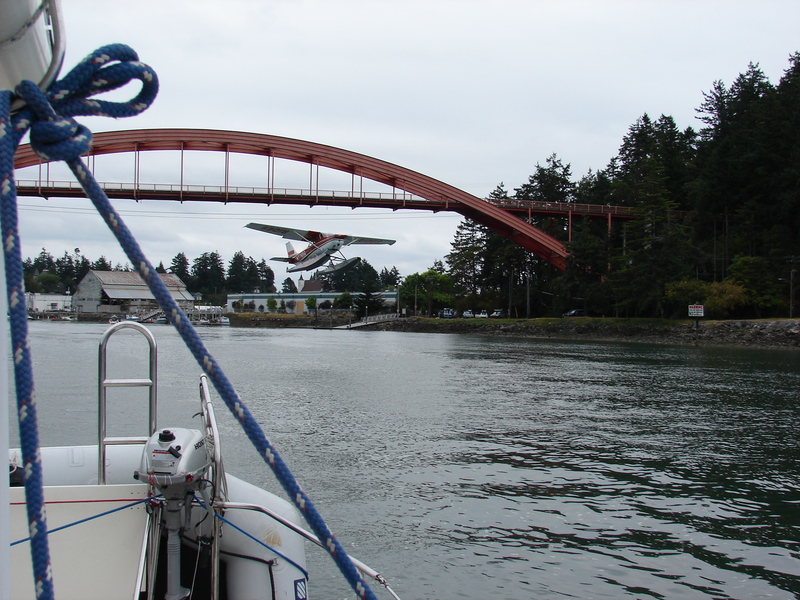 I’m guessing it’s illegal to fly under the bridge. Update on the swim step. We finally finished the swim step. 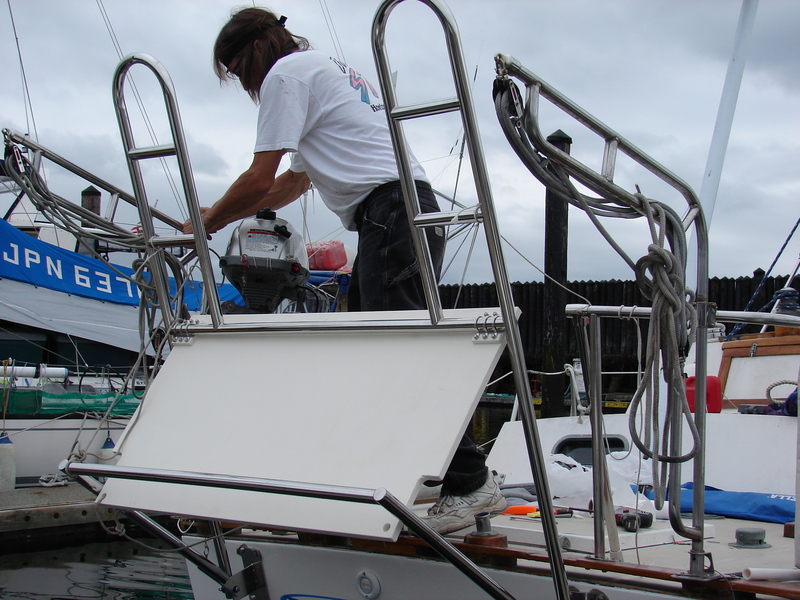 We used stainless steel pad-eyes to attach the platform. They’re pretty light duty so we used several. 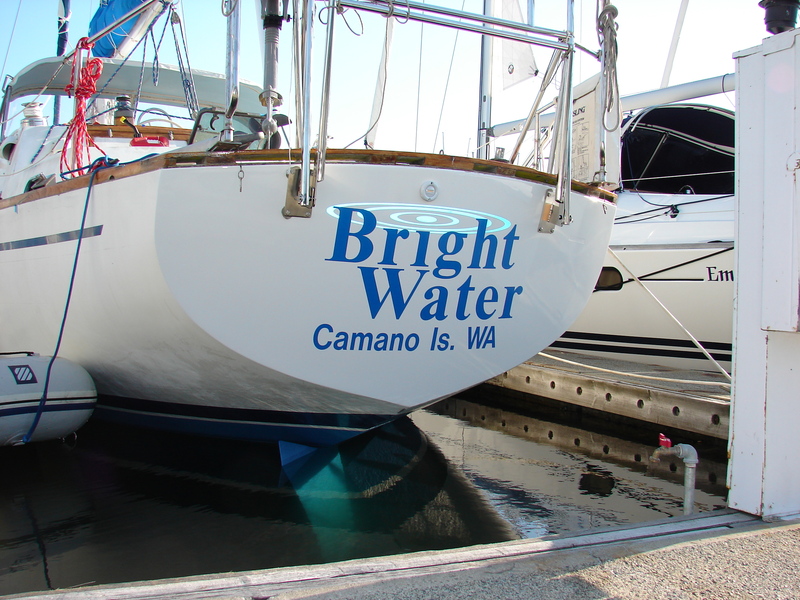 We’ll need to rig a lifting line to control the drop and a bumper on the transom so we don’t bang up the new paint. Notice that Nancy is wearing socks with her sandals in the middle of the day in the middle of August. I can’t wait to go south. Four days ago. They picked her up, then they set her down. In a hurry. Because it was low tide, and getting lower. But no problems. 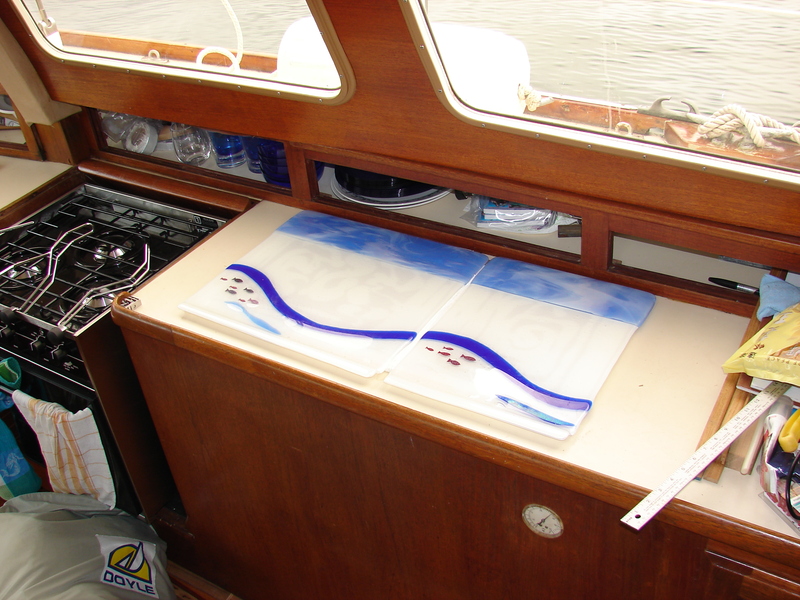 We re-finished the transom while we were on the hard and applied the name in the slip. It would have been better to apply the name on the hard also, but you can’t always get what you want. Same shot with flash. The rings are retro-reflective, like stop sign material. She looks like a boat. 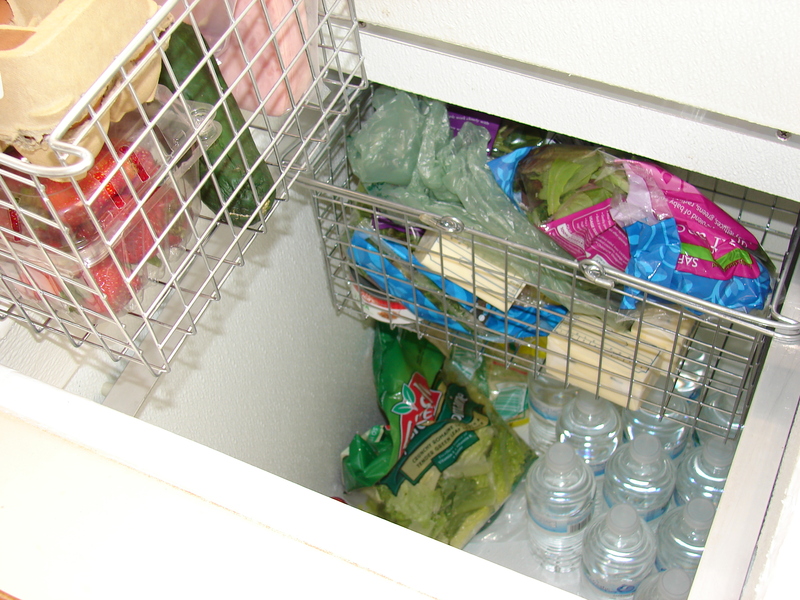 We even got the laundry up. 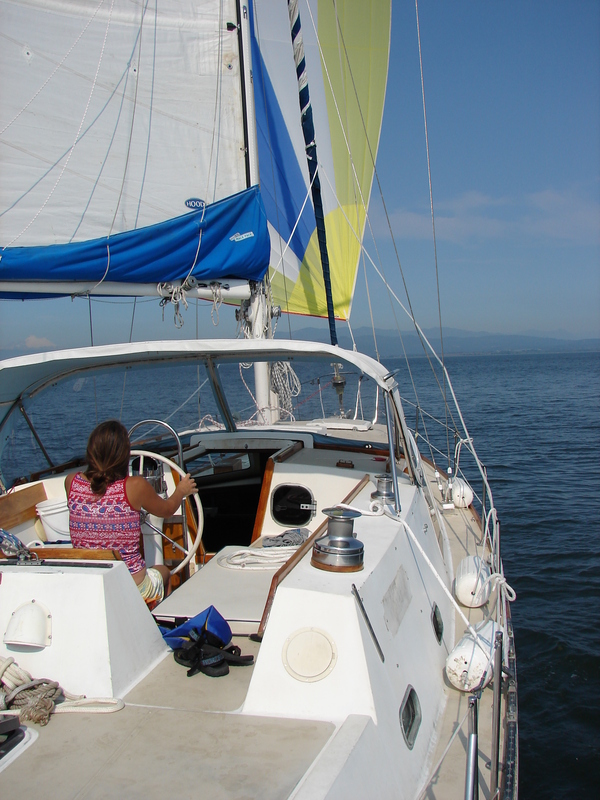 The colorful thing is our asymmetrical spinnaker. Easy to fly in a five knot breeze. We’ll try again later with more wind. The other colorful thing is Nancy. Once again, there are no pictures. 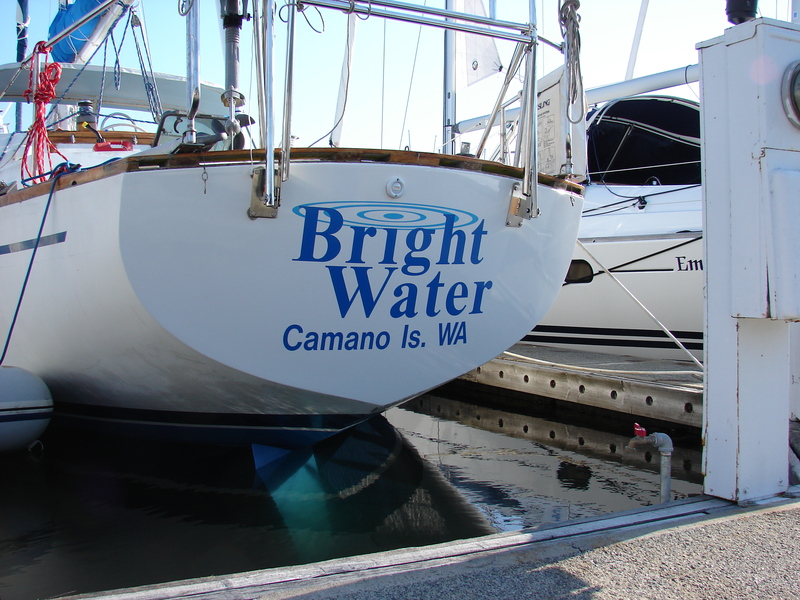 We moved Bright Water into a slip today, but can’t prove it. Backed it into a slip, in fact. No proof. Nothing. So instead, I’ll tell you a story. 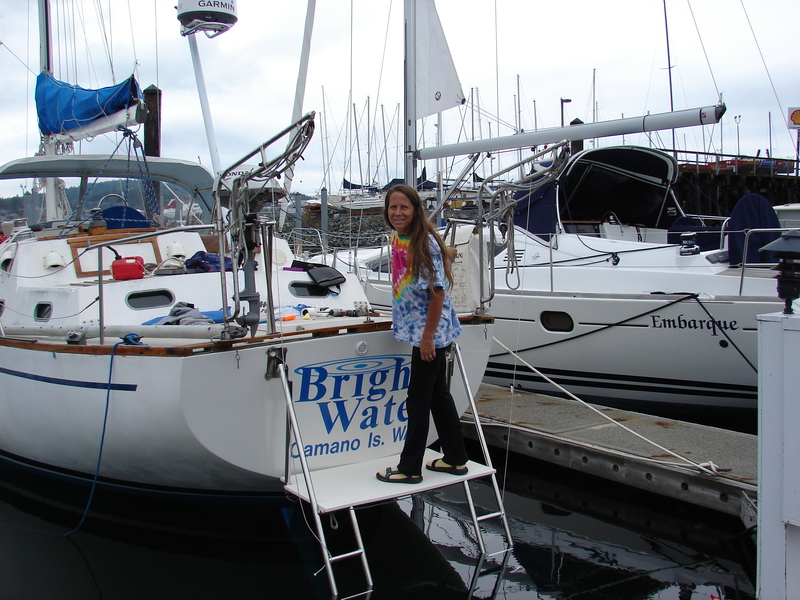 We met a very nice couple in the boatyard a few weeks ago. His name is Rich and her name is Lyn, which is probably short for Linda, which is roughly spanish for beautiful. So we met a rich guy on a nice boat. He had a beautiful woman with him. Huh. Shocker. Finally, two names I can remember.